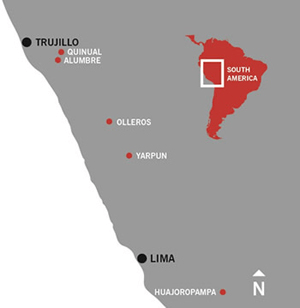 The project is located 70km southeast of the major city of Trujillo, in the north of Peru. The project is serviced by the nearby Pan Americana Highway and includes good infrastructure to the project area. These concessions consist of Chupon, Alumbre and the directly adjoining Magdalena concessions. 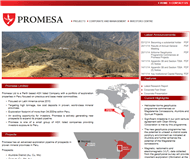 The area controlled by Promesa comprises 36 concessions covering approximately 28,500 Ha. 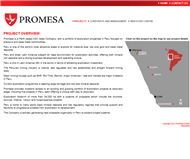 Several other early stage projects are located on the other Magdalena concession but are at an early stage of exploration by Promesa. These concessions were explored in 1994 by Newmont Mining Corporation who carried out regional exploration in the area. Between 1995 and 1998 Savage Resources Limited (“Savage") (Pasminco Limited acquired Savage in 1999) undertook a significant exploration program within the area, which included stream sediment and rock chip sampling, geological mapping, geophysical studies and drill program. 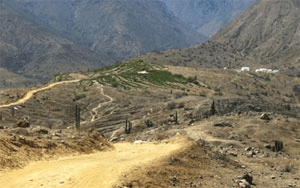 These concessions are located in a regional corridor of world class gold and copper mines, with characteristics similar to El Galeno, Conga and Tantahuatay, amongst others in the region. The Alumbre Project is a potential Au-Cu-Mo porphyry and epithermal Au mineralisation system which is located over several of the company's adjoining concessions. Alumbre concession demonstrate the potential of being, both the high sulphidation oxide deposit at Alumbre and an outcropping porphyry system located on the boundary between the Alumbre and Magdalena concessions. Independent consultants were engaged throughout the geophysics program and mapping phases and confirmed the prospectivity of the property and high-sulphidation to porphyry environment. Consultants had recommended a 22 km IP geophysics program which was completed in December 2012. In early 2013 results of the induced polarisation (IP) geophysics program at Alumbre had produced a strong chargeability anomaly extending from near surface to below the modelled 600m depth. The IP anomaly identified by Promesa is located approximately 500m southeast of Savage Resources drill hole CJK-1 which returned 110m at 0.12g/t Au (including 8m at 0.50g/t Au). The IP anomaly is approximately 700m wide and 1500m long with a large chargeable volume and is open at depth. The chargeability anomaly has a size and intensity commensurate with what would be expected from a medium to large sized mineralised porphyry system. 3D model of the chargeability signature at different intensities which is strongest at 200m to 300m below surface and indicates that the chargeability continues towards the northeast and is open at depth. High-sulphidation alteration and veining occurs at surface. Strong argillic alteration is thought to form a lithocap over, or adjacent to, the porphyry intrusive centres and the recent geophysics modelling supports this. Following the geophysics program, a detailed geological mapping and geochemical sampling program was undertaken and completed during April 2013. Strong argillic and silica alteration of multiple intrusives is present at surface over the area of the chargeability anomaly. An independent petrographic study of hand samples was prepared for thin-section microscopic analysis and also by scanning electron microscope to positively identify sulphide species, Au and alteration mineralogy. The results confirm that Alumbre is Au-Cu-Mo porphyry system with areas of intense quartz-sericite hydrothermal alteration and multiple intrusive types and hydrothermal breccias as indicated in the accompanying photomicrographs. Petrography, geophysics and mapping combine to form a robust geological model of a mineralised porphyry system. The project demonstrates a strongly argillically altered area which appears to form a geochemically depleted lithocap interpreted to be from intense acid leaching and late-stage hydrothermal alteration. Strong quartz-sericite alteration has been identified in hand sample, in thin section, by electron microscope and by hand-held spectrometer at Alumbre. Gold, copper, molybdenum have been identified in hand sample and in geochemical assay. The Company is pleased that sound scientific investigation continues to validate the porphyry model at Alumbre. The Company's spectrometer specialist has identified hydrothermal alteration mineral species using a Terraspec spectrometer. Alteration mapping, assisted by the results of the Terraspec spectrometer, have determined that a valid porphyry-style alteration system exists, with the strongest argillic and silica-clay alteration over the area of the chargeability anomaly. The hydrothermal system appears to have multiple intrusive centres each representative of a separate intrusive event. The environmental impact assessment (referred to in Peru as a DIA) is complete and includes all environmental, community and social approvals to allow the Company to commence drilling on the project area. The DIA declaration is expected to be lodged with the Peruvian Ministry of Energy and Mines (MEM) within the next few weeks. Upon approval by the Ministry, the company will commence preparation of drill platforms and mobilisation of the diamond drill rig to site. The 5,600m diamond drilling program targets areas of high chargeability supported by geological mapping of the alteration system and Terraspec spectrometer testing. This drill program will be undertaken in three stages with the first stage drilling of approximately 1,500m in the northern sector of the project area. The drill program will be designed to target porphyry Cu-Au-Mo mineralisation associated with various parts of the chargeability anomaly. The chargeability anomaly is large and open to the south east and indicates a very large mineralised system. Commencement of exploration fieldwork will be undertaken during the 2013 to assess the potential regional targets within the Magdalena concessions. 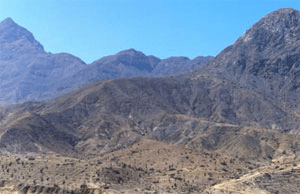 The Huajoropampa concession is located in central Peru, in the Ancash Department. The concession is 1000Ha. At altitude of 4000m ASL and is 305km from Lima. 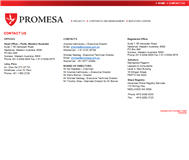 The Company announced on 12th April 2012 that it had entered into an option agreement to acquire the Huajoropampa Concession. The earliest document work on the Huajoropampa was by Pasminco in 2000-07 and Teck 2007-09, which executed Greenfield's surface geological studies within the regional, with several junior exploration companies have undertaken small scale sampling within the project area. No historical geophysics or drilling has been completed on the project. Hydrothermal alterations, geometry, and an extension that confirms a Skarn-type deposit with poly-metallic mineralization (Pb-Zn-Ag). The potential Skarn target size is 1.0 x 2.0 km, with dolomite breccias and vein structures with polymetallic mineralization. Further work is required to interpret geological surface information and a potential drilling program. 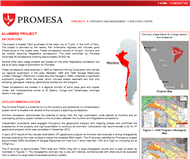 The project is similar to Santa Rita located in Huancavelica-Peru, (7.4g/t Ag, 13% Pb and 9% Zn). The geological setting is formed by the Cretaceous age Casapalca Limestone formations and Chulec Jumasha Pariatambo covered by andesitic / rhyolitic and intruded by a diorite stock of the tertiary age and covered by quaternary material. The alteration minerals are barite, calcite and garnet. The sulphides are galena, sphalerite, and sulfosalts for Ag. High-grade Zn-Pb mineralization are (oxide & sulphide) hosted by breccias, replacements and structures with grades up to 2% Zn, 2% Pb. The Huajoropampa prospect is adjacent to the nearby Minera IRL concessions who are currently undertaking exploration work in the area. Preliminary site visit has been completed. This project will be reviewed in 2013 in terms of the Company exploration strategy within the region. 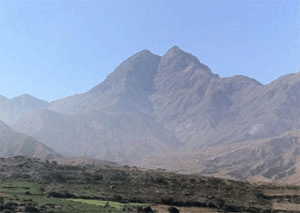 The Olleros concession is located in the central Andes of Peru near major cities of Huaraz and Recuay at Ancash Department and is currently under application. Olleros was the subject of exploration in the early 1990's. Work conducted included geochemical, geophysical and diamond drilling by mining companies including Barrick, IRL Peru, Teck and Meridian. The Olleros concession of 3,600 ha has been applied for based on the geological assessment of 5 alteration zones found in an area of 12 x 6 km. The areas are Parianan, Antacocha, Pariapata, Huantune and Aco. The concession holding surrounds the concessions held by Barrick Gold Corporation. Olleros is in the same geological, structural and metallogenic corridor as Barrick's Pierina Gold Mine, which is a low cost and multimillion ounce production operation. Each area within Olleros demonstrates alteration zones with the potential for epithermal and porphyry occurrences, pyroclastic rocks hosted in Calipuy Group and dacitic porphyry of Tertiary age that are an excellent host of potential Au-Ag and Cu deposits. The area has a strong argillic alteration and oxidation identified by satellite images. The mineralisation is hosted in volcanic rocks of the Calipuy Group, intruded by porphyritic bodies composed of dacites and riodacitas acid. Geochemical results for gold, copper and molybdenum anomalies show encouraging values. The concessions are within the corridor of Au and Cu deposits of the Cordillera Blanca. Geologically, these are hosted within volcanic rocks of Tertiary age and are represented by the Calipuy Group and pyroclastic rocks composed of rhyodacitic tuffs. They are intruded by porphyritic dacites and riodacitas composed of acid to intermediate composition, structural stage and throughout the Andes are controlled by regional faults in a NW-SE direction and local faults NE-SW direction. The combination of these two fault systems generate favourable environments where hydrothermal fluids were replaced with mineral solutions that formed mineral deposits in the area. The best known deposit of this corridor is Barrick's Pierina Mine. The Company is currently assessing social and community issues within the concession area and is undertaking further samples and high level mapping of the concession. Olleros is a district of high exploration activity within Peru, due to surrounding projects and historical activity. The Company is currently assessing social and community issues within the concession area and is planning to undertake further sampling and high level mapping of the concession. The Quinual concession is located in the Western Cordillera of the northern Peruvian Andes and about 71 km to the southeast of Trujillo, in the department of La Libertad. The Company announced on 12th April 2012 that it had entered into an option agreement to acquire the Quinual Concession. Quinual is prospective for Au, Cu & Mo and comprises an area of 1000ha. The earliest document work on the Quinual was by Buenaventura JV Newmont in 1996, which executed Greenfield's surface geological studies within the regional, with several junior exploration companies have undertaken small scale sampling with the project area. No historical geophysics or drilling has been completed on the project. Potential for large a high sulphidation epithermal Au-Ag deposit related to a Cu-Au-Mo porphyry deposit at depth. Tertiary volcanic sequences composed of with dacitic to rhyolitic volcanic rocks belonging to the Calipuy Group. The alteration covers a large epithermal hydrothermal centre area of 2.5 x 1.0km NE-SW, with advanced argillic alteration assemblages of silica-alunite-FeOx, abundant disseminated veinlets with silica-FeOx and hydrothermal breccias with silicification with vuggy texture. The sulphides are pyrite disseminated in veins, the oxides are disseminated hematite (box work), and in veins (stockwork). Field samples shows high values in As (30,200 ppm), Sb (1849 ppm), Hg (22 ppm) and outlier values of Au (63ppb), Ag (14 ppm), Cu (186ppm) and Mo (181 ppm), which are all significant pathfinder minerals. Deep geophysics program has recently been completed which outlines the potential porphyry deposit on the concession. Early stage work has shown characteristics analogous with the Marte-Lobo 5.8Moz Au (Maricunga-Chile) and El Galeno 486 Mt @ 0.57% Cu deposits (Peru). Mapping, geochemical, spectral testing and geophysical results have been received on this concession which demonstrates promising results. The mapping of the alteration demonstrates the potential for epithermal environment. The geochemical results shows a stronger response to gold to the south with Arsenic results demonstrate the classic pathfinder element for Epithermal deposits. Typically arsenic is found in pyrite, galena, and some other sulphides that are typical of epithermal deposits. Deep Magnetics and Induced Polarisation geophysical survey over a total linear length of 9.2 km to an approximate depth of 600m has been completed. The survey has yielded outstanding results, with significant chargeability anomaly at depth of 100 to 150m below surface, with the potential of porphyry target and provides direction for future exploration. The geophysical survey was carried out concurrently with mapping and sampling. Ongoing mapping and geochemical sampling program within the region. Exploration activity has demonstrated that geochemical and geophysical results improve to the south of the prospect, which further mapping and sampling is planned for in the second half of 2013. This work will coincide with the commencement of community and social engagement to prepare the project for environmental studies and potential drilling to be undertaken in 2014. The Yarpun concession is located in central Peru, in the Ancash Department. The concession is 100 Ha. At altitude of 4000m ASL and is 305km from Lima. The Company announced on 12th April 2012 that it had entered into an option agreement to acquire the Yarpun Concession. The earliest document work on the Yarpun was by Newcrest in 1998-04 and Newmont 2004-05, which executed Greenfield's surface geological studies within the regional, with several junior exploration companies have undertaken small scale sampling within the project area. No historical geophysics or drilling has been completed on the project. Polymetallic vein-type fillers with Zn-Pb-Ag and Au mineralisation, and iron oxide quartz veins with Au-Ag mineralisation. The veins are up to 300 meters in length with a width of up to 3m. 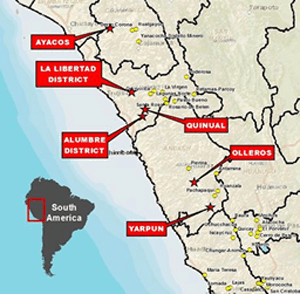 Yarpun Project is similar to the Contonga deposit (Zn-Pb-Cu-Ag) located in Ancash, due to the fact that the Yarpun prospect has 3 veins with iron oxide quartz Au-Ag mineralization and 1 polymetallic vein with Zn-Pb-Ag mineralization. The project is a small strategic holding adjacent to BHP Billiton's and Minsur concessions. The potential target area is 1.0 x 1.0 km. The system has veins with polymetallic mineralisation (Sp-Ga-Cp) and oxide mineralisation veins with Au-Ag. Field samples shows high values in As (30,200 ppm), Sb (1849 ppm), Hg (22 ppm) and outlier values of Au (63ppb), Ag (14 ppm), Cu (186ppm) and Mo (181 ppm), which are all significant pathfinder minerals. The geological setting is vein structures and is located in sequences of volcanic rocks of Cretaceous age and the Calipuy top-tertiary age group. The volcanic rocks host geological environment is favourable for grain filling systems. The alteration is argillic, propylitic, kaolinite, chlorite in nature. The mineralisation is hosted in quartz vein structures with massive sulphide polymetallic mineralization and quartz with iron oxides, the sulphides in sphalerite, galena, chalcopyrite, sulfosalts of Ag and the Fe hematite, jarosite and limonite in the oxide zone. Artisanal mining within the concession area requires follow up to confirm material being mined.